After a week of storms that took power and phone lines down it was a slightly reduced party who arrived at the Aite Cruinnichidh hostel on the Friday night. Plans were made based on a forecast which was slightly less worse than expected. On Saturday everyone departed for their chosen walks. 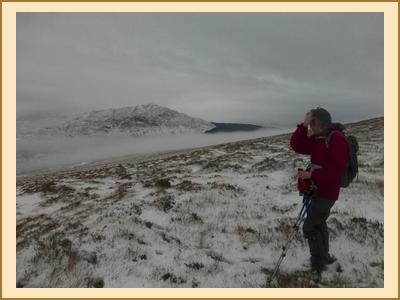 Dave & Pauline had a viewless day on Beinn a' Chaorainn (a challenge to navigate on in poor visibility). Fiona, Mike & Gillian took advantage of the Graham Cnapp Cruinn being behind the hostel and enjoying some monochromatic views of the Grey Corries. This was part one of Gillians smaller bell ringers triathlon. The east end of the Grey Corries were particularly popular with Anne & Alan heading up Stob Ban. Martin, Ian, Katrina & Paul headed up the Corbett combo of Cruach Innse & Sgurr Innse. We're not enitrely certain what Aga & James went up but it looked snowy in the pictures. Kate & Alison headed off to Glen Roy where unfortunately they got no views. Back at the hostel Aga's Polish vodka went down a treat and helped liven up a very sociable evening! Gillian completed parts two and three of her bell ringers triathlon by ringing at Tulloch with some friendly camponologists who were also staying at the hostel. (Part three was a small glass of wine) If you want to know what the full triathlon is then I suggest asking Gillian. 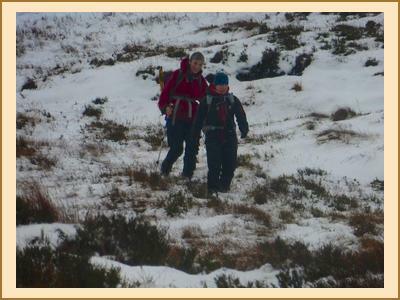 The weather on Sunday was not so good and thus there was little enthusiasm for the hills. This didnt deter Martin, Ian and Paul who headed up Beinn a' Chaorainn in particularly foul conditions. The rest of us decided that low level walks or coffee were better options.